Hello. Welcome to my website. 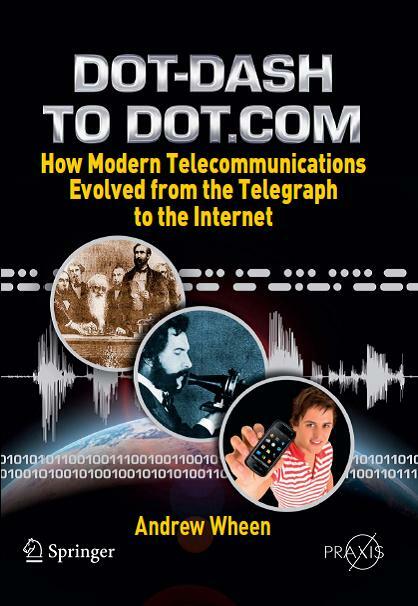 I’m Andrew Wheen, and I’ve recently published a book on the history of telecoms. If you use a mobile phone or surf the Internet, then this book should be of interest to you. If telecoms play no part in your life, then sorry to trouble you – but how are you managing to read this? The profusion of web sites and applications that characterize the modern Internet may seem a far cry from the primitive telegraph systems of the late 1830’s. There is, however, a direct link. The invention of the electric telegraph paved the way for telephone networks which, in turn, laid the foundations for today’s Internet. In less than 170 years, simple arrangements of magnets, switches and cables evolved to become the largest and most complex machine in the world. How did this happen? What were the inventions that shaped modern communications? Who were the key players in this amazing story? How does the Internet work? And what is coming next? This book attempts to answer these and many other questions, bringing to life the characters, the times they lived in, and the technological revolution that they brought about. shows where telecoms has come from, and where it’s going in the future. If you would like to learn more, there’s plenty of cool stuff hiding on this website. There’s also my Ramblings blog which comments on telecoms-related stories – both old and new. If you have any helpful comments or suggestions, there’s a contact form on every page. Have fun!